The wind buffeted Ja’Deir’s fur as he completed his second round of mudras, to seal his prayer to Osiris and to Isis, his resolved constitution. He opened his eyes after several seconds, waiting for the internal confirmation that his words were received by Apis and her pantheon… err I mean Ra’s Pantheon. The first thing he laid eyes on was a strangely familiar black figure on the docks, talking to an exuberant hob goblin. After a beat, he realized that this was the being that he had thought dead! Suddenly, the pall that had been hanging over him – and unbeknownst to him, over the whole crew – lifted! The brave creature was alive! With a squeaking cheer, and a psionically boosted leap, he glided the last few hundred feet to the docks. The cool air over the water rushed by, and stung his eyes, making him blink, and lose his sense of direction at the last minute, crashing into a stack of boxes! The dark figure yelped and made to dodge out of the way of the rodentine projectile, but his feet went the opposite direction as his torso. The result was a very wet leather trench coat, and a warrior picking barnacles off of the docks sheepishly. Seeing this outrageous display, the spirits of the depressed crew lifted, except for the Priest, who was below decks at the time. Once all of CrIsis had descended the gangplank, and had joined in the revelrie of lost opportunities returned, and friendships rekindled, Burlap caught wind of the Priest’s mood. The prankster that he was, he performed some… “slap-stick” gags?… whatever they’re called, and whichever sticks needed to be slapped, they were. The magical contagion of the jokes spread, and soon enough Indaris’ face split in a grin, and a roaring laugh escaped his throat. Ja’Deir paid for some of the merchandise he’d ruined with a few signed copies of the Books of CrIsis, and the group was set upon by guards. CrIsis’ stances shifted, to be ready for a fight, but the guard seemed more interested in keeping the crowd from rioting. An emissary followed in the guards’ wake, and walked up to Indaris, summoning all of CrIsis to come with him. After some glances back and forth between each other, they decided to follow him. A giant pyramid wrenched their attention as they walked down the wide promenade leading to the palace of Credia. Whispers broke out among the adventurers, speaking of the import of such an event. Ja’Deir took the opportunity to hang back to speak with No Name, who was walking a few steps behind everyone else. He asked him if he would consider a Mind Bond. The wary warrior cautiously declined, saying that he doesn’t feel comfortable with that. Ja’Deir said he understood, and wouldn’t press until he’d had a chance to get to know the other “Heroes of Credia” better. Inside, Ja’Deir became suspicious of the mysterious man, but as he always does, Ja’Deir accepts everyone, at least externally. He just got himself ready to put up his psionic shield if the need were to arise. CrIsis reached the King’s quarters, and there weren’t chairs for anything not of normal human shape, weight and size. Xerx’ses, in minotaur form, and Raulf both started to kneel. Not wanting them to feel out of place, Ja’Deir created two cushions of psionic ectoplasm for the two to sit on. It would look like they were sitting on a cloudless mist, but it was better than having them kneel like servants. Raulf whispered in my ear if the cushion could reach up his back, too, and if it had a ”Xyatsu Massage” setting. I complied, and he let out a relaxed growl as he melted into it. The heroes retired to their appointed rooms in the Palace complex, to sleep it off. Ondemeira visited Father Indaris late that night. The priest spoke with the retired editor in chief of the Books of Crisis for some time about our dreams, hopes, and goals. The Priest was put off guard by the familiar face – which was very pretty at that. If it weren’t for the premonition of the Squirrel, the possessing entity inside of her might have made it away quietly with all of our secrets. It sensed the mind mage’s attentions, and locked Indaris in Xerx’ses’ bedroom. As it closed and locked the door, Ja’Deir left his bedroom, and stood facing it off in the hallway. The resulting battle should have, by all accounts, killed all of CrIsis. The possessing entity slowly made its way around CrIsis’ ranks, possessing them all in turn, and it very nearly destroyed the group. Ja’Deir needs to talk to the Mages and Priest of the group, so as to find out how to protect ourselves from such a menace in the future. The night that lasted several lifetimes ended, and when it was over, it felt like from the point Burlap was possessed through the rest of CrIsis passed as if by a few sentences uttered by a God. The next morning, CrIsis and King Guy’s regime held a public mourning for members of CrIsis lost. Though most of the populous did not know Asher, they joined in the mourning for him with almost as much vehemence as when they mourned the loss of Overkill, the longest lived member of the group, and in most of the world’s eyes the face of CrIsis. There were short phrases uttered by humble peasants, and longwinded orations given by politicians, but one thing that will stand out forever in everyone’s hearts is the funeral hymn that came from the Minotaur. To the world he shows a hard exterior, pretending to not care if they hate him or persecute him. But to CrIsis he shows his true self, one of a soft-hearted, caring, and self-conscious man. The hymn revealed that side of him to the world. There were very few dry eyes in the crowd. That evening, CrIsis made their way to deliver a piece of Osiris to his Pyramid. Ja’Deir thought, as they made their way to the hallowed ground, that CrIsis has become too blase, with their treatment of the pieces. Delivering a lost part of a god to its proper resting place should never be refered to as “Dropping it off.” that seems like CrIsis focuses on its next destination as the more important goal, and they are merely tossing the piece along the roadside as they pass a temple’s city. Truly, not a fitting description. ReSet stopped us at the foot of the pyramid under a white flag. None in CrIsis were under any delusion that they might actually honor that meaning of truce. They were the followers of the Gods of Deciet, afterall. But Ja’Deir was a bit surprised at the deceit in the Priest’s eyes as he made plans to break a verbal contract. Granted, Ja’Dier was not a follower of Isis, and so he did not know what the morality of her priests were supposed to have, but as a follower of the Nurturer, Ja’Deir had been taught to deal honestly with those around you, at least with your allies. He hid a devious grin as he promised that CrIsis would be out of the temple and available for a summit. With such morals, no wonder Rurga hates CrIsis. I wouldn’t be surprised if she assisted the Pantheon of Taut against CrIsis, even as opposed to the Dark as she is. We ascended the pyramid, and arrived in the holy antechamber. Though she hates water, even Hannah washed, and all were ready. He was wrenched out of his contemplation by something the Sphynx said… He called himself the Librarian, and mentioned he knew the Khejas family! SEE what the gods do for those who are faithful? Here was the treasure trove of knowledge that Ja’Deir needed, one that he COULD NOT have found, had he blindly followed after his own heart or his own quest. The illustration of it was so clear to Ja’Deir that he prostrated himself and signed ‘Zen.’ He rose, and spoke up, much to the surprise of the others. They thought he was ignoring them all, apparently. After learning much from the Sphinx, and having deposited their precious cargo, CrIsis made their way back down the stairs of the Temple. All but the Priest were confused at the passage of several days while they were in the temple – CrIsis had dealt dishonestly with ReSet, and it was widely known. CrIsis are the righteous, not the underhanded. It isn’t their duty to deceive those that deceive. Some in the crowd that awaited their return thought so as well, and there were arrows fired at CrIsis. The assassin was caught, and was nearly terrified to death by the Wolfen. Raulf was enraged. He learned from the sniveling human that there was a bounty on his head. In his anger, he let lose, and the man voided his bowels. Hannah, not able to handle the slap in the face, at least from her point of view, she stormed off, back to Rogtilda. She had offered a more “Humane” method to interrogate, but CrIsis, freshly off of a Faerie Alchoholic Misadventure weren’t willing to give her a chance. The adventurers turned the man in to the constabulary, and he seemed relieved that it was just normal prison he was looking forward to, not vigilantism dealt by Righteous Crusaders. CrIsis returned to Rogtilda, but were met by ReSet, who’d waited till dawn at the temple for us, then waited at Rogtilda, so as to not miss us as we slunk back to our ship and fled. We prepared ourselves, tension rising in the two groups. A tumble weed crossed the cobbled street before us, and a seagull circled in the air above us. Sweat trickled down the face of No Name, who was trying to hold back from killing his arch nemesis, and Burlap’s stomach gurgled. With a chittering shout, Ja’Deir launched forward, and felled Zizean in a single blow! The battle ensued, and in the insanity, people fell. Three of their rank had been destroyed – Darksong, The Necromancer,, and Zizean, who was merely unconscious, but seemed dead – and one of ours had been slain by an evil ritual of the necromancer – Raulf, Holder of the Hand! One of the remaining members of ReSet did what they always do when they are close to losing half their members – he touched the Amulet, and brought most of his team, and our fallen comrade with the piece, back to Cynopolis. CrIsis faces a conundrum. How and when should a raid on the City of Taut be performed? It is imperative now, as we need to recover all of the pieces of OsIris to restore him to his full potential, but in our present condition, it would be a suicide mission. Who knows? 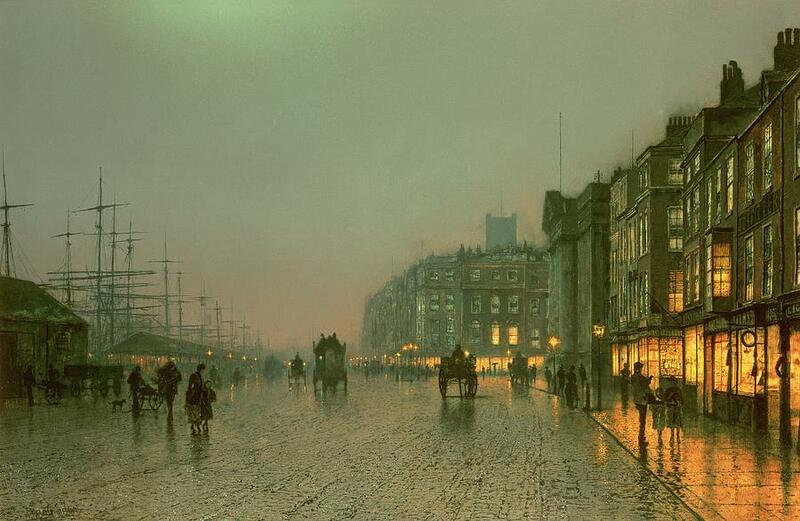 >>Excerpt from his journal spanning Gryphon 27 and Grekar 5, while in Credia, in the 4th year of CrIsis, written by Ja’Deir, Ashada Mind Mage, disciple of Apis.<< >>Picture credit:Fine Art America and John Atkinson Grimshaw.